The City of Alameda Democratic Club participated in the 4th of July parade! A big thank you to club member Alan Pryor for lending and driving your vintage Model T for the event! Also, thank you to everyone who helped decorate our parade entry and participate in the parade! 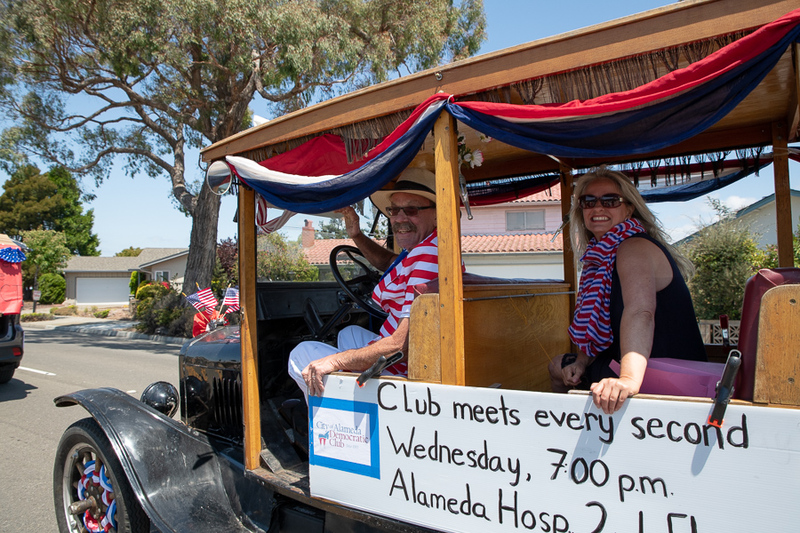 Fun fact: Did you know that Alameda's 4th of July parade is one of the longest in the country? At 3.3 miles, it is indeed one of the longest parade! Vice Mayor of the City of Alameda as well as Co-President of the CADC Malia Vela addresses a crowd of Alamedans. 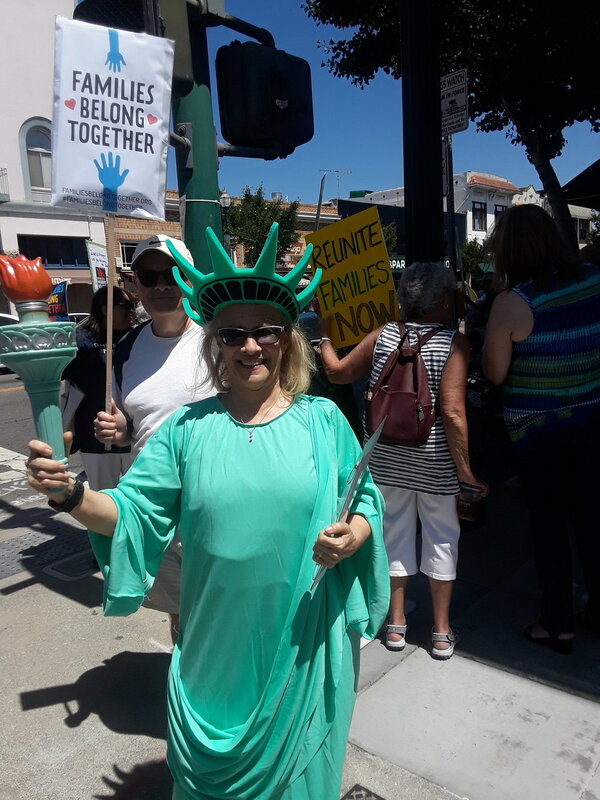 On June 30th, Alamedans gathered on Park Street to protest the Trump administration's immigration policy and to show support to families who had been separated at the border. Vice Mayor Malia Vella (Co-President, Dem Club) and Councilmember Marilyn Ezzy Ashcraft delivered messages of hope to families being torn apart at our border, and thanked those attending Alameda's "Keep Families Together" vigil, held in conjunction with rallies taking place nationwide. 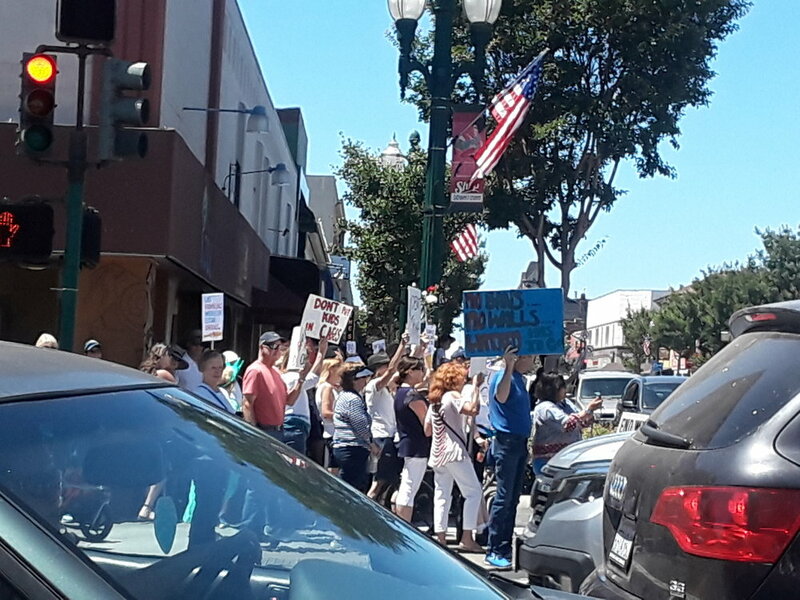 The 300+ crowd gathered at Park and Santa Clara for a well received honk and wave after which the majority marched to Jackson Park for a rally. "As we head towards the 4th of July, let's remember that Civil Rights will forever be tied to this nations birthday." said Gaby Dolphin, closing the event. "It was then our Founding Fathers enshrined for posterity these sacred words: "..all men (and women) are created equally, endowed by their Creator with the inalienable right to life, liberty and the pursuit of happiness." A chorus of horns could be heard along Park Street as Alamedan's driving past expressed their support of the demonstrators. On January 15th we took the time to observe MLK Day. Some members of the City of Alameda Democratic Club joined the Alameda NAACP Rally outside City Hall and participated in the event's march. Local Activist Rasheed Shabazz addresses the crowd. Co-President Gabrielle Dolphin and Club Member Amos White watch from the crowd. 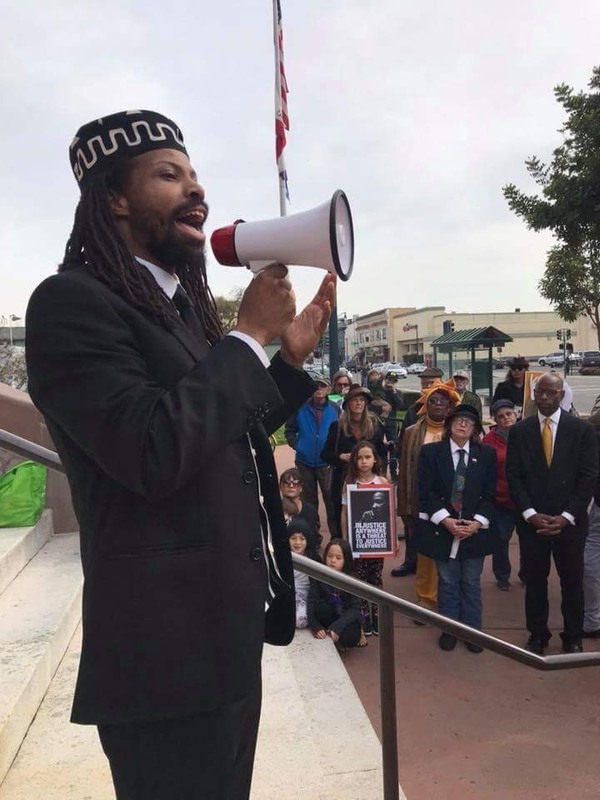 I am humbled standing before you addressing Alameda’s NAACP Martin Luther King Jr. Day march and rally. To Alameda’s Black community, and all her communities of color I offer my heart and support. My message however is for my White brothers and sisters. I fully recognize the fragility of our community around race issues, that delicate sensibility that mutes us when it’s time to speak up. Today however, is the day to speak up. My White brothers and sisters: it is time to wake up and in the inimitable words of our Congresswoman Barbara Lee, it’s time to “Stay Woke.” It is time to make Martin Luther King’s dream a living walking reality instead of a once a year holiday we take off from work. While many participate in our community cleaning shorelines and beautifying schools, I wish this day weren’t so much a day of “service” (it reminds me of the term servitude) and instead this were a day of justice action. Fifty five years ago Rev. King stood on the hallowed grounds of the Lincoln Memorial and proclaimed the “urgency of now” saying it would be fatal to overlook this urgency. “There is no more time for “cooling off” or the tranquility of the drug called “gradualism”. That was 55 years ago and we’re still fighting the same fight. Dr. King reminded us of our history and the promissory note contained in the Constitution and Bill of Rights. That note guarantees ALL human beings the inalienable right to life, liberty and the pursuit of happiness. All he ever asked was that this nation holds true to its word. You and I White brothers and sisters, we who in some form or other justified or rationalized our “goodness” our “non-prejudice” with “I have a Black friend,” or convinced ourselves we were the beacon of hope to the world in the matter of human rights - it’s time to recognize our Nation has defaulted on its note. The result has been chaos from the top down. The President of our nation unleashes and “normalizes” with impunity the most inhumane, unconscionable rhetoric on our communities of color - around the world with fallout felt locally. You and I are complicit in this bankruptcy. Our White silence must end. If you have caught yourself asking, “when will they ever be satisfied?” or have the need to reply, “ALL lives matter” when you hear “Black Lives Matter” - you don’t get it. If you are convinced we live in a safe community because our Police Department is wonderful and Alamedans’ aren’t afraid to call for help - you don’t get it. If you see a Black man walking the East side or down Grand and catch yourself thinking “why is he here?” - you don’t get it. If you’ve thought that in the face of Police violence on the Black community, “they should just obey, they’d be ok,” - you don’t get it. When you’ve heard “housing is a human right” do you consider Blacks not human? You really don’t get it. If we don’t “get it” WE are the problem. Institutionalized racism and the prejudice that comes with it is impossible to spot but spot it we must. Like fish swimming in the ocean there is absolutely no awareness of being surrounded by water; unaware of what defines them, gave them birth, gives them life and sustenance and everything needed to navigate and live relatively effortlessly. In the case of institutionalized racism, there are others - people of color and the poorer among us - swimming in the sea of institutionalized racism who are gasping for air and life itself. In addition to attending the rally and marching, other club members stood vigil at the corner of Park and Santa Clara. These individuals held signs and reminded passersby that this wasn't just any three day weekend. Other members observed the day by committing acts of service. 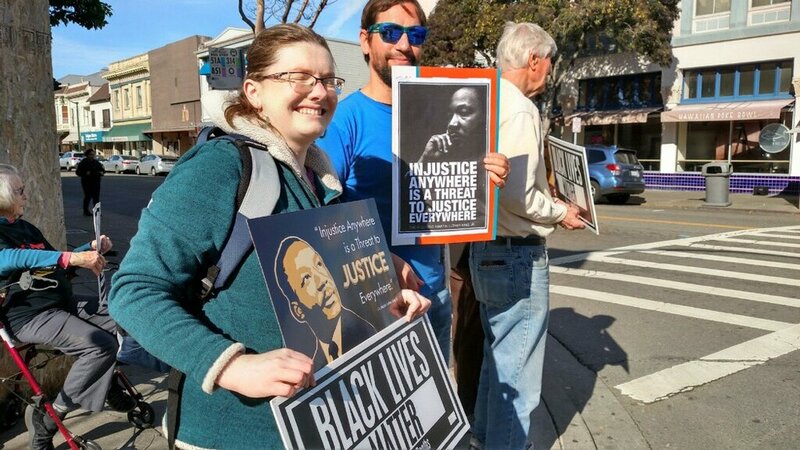 Alamedan's participating in a vigil on MLK Day.